Having made an indie-twin stick shooter myself, I know it's a tough market to crack. Still, the reason I chose to create a game in that genre was because its a genre so near and dear to my heart. So when I got an email about XenoRaptor with the subject line "Fight rocket propelled chainsaws as a cyberdragon in this co-op bullet hell" I knew I had to check it out. What I didn't expect to find was an beautiful shoot em up with super fast paced and challenging combat. Perhaps most surprising was a deep upgrade system allowing players to customize their ship with not only weapons, but color and style. Also available are weapon unlocks and upgrades which you can earn just by playing XenoRaptor's various modes which include single player, versus and co-op. Players equip two standard weapons and a special weapon to take on the onslaught of strange mechanical and alien enemies. I played a bit of XenoRaptor and the weapons in the game are definitely the highlight. 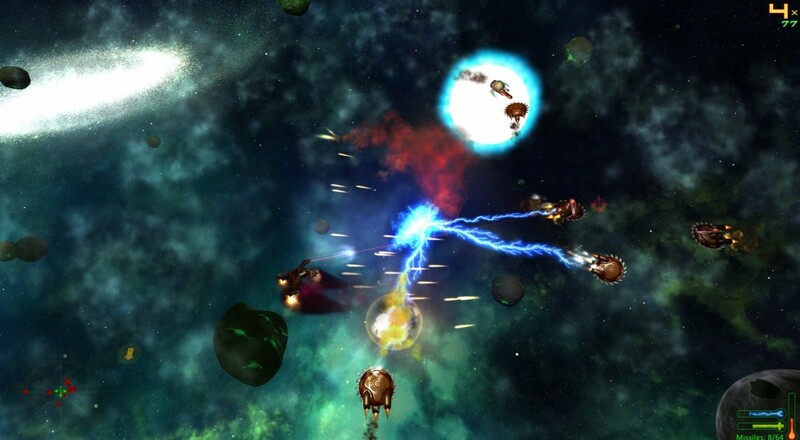 Of particular fun is the gravity control beam which allows you to grab and toss large asteroids at your enemies. From what I've played of XenoRaptor it's a very challenging game. Luckily there's an 8 player online co-op mode to help ease the pain and unlock goodies. Players can jump in and use their own ship to conquer any of the game's missions. There's no progression or locking system, so you can jump around and play the missions in any order. XenoRaptor isn't quite ready for release yet, but you can still purchase it direct from the website and get immediate access. It's being improved upon every week. The game is also up for vote on Steam's GreenLight. Page created in 1.4457 seconds.